In this article i will share complete information about camshaft position sensor, so you will know the basic function, working principle, the bad symptoms and also replacement cost of this sensor. The camshaft is an important device for the internal combustion engine of any vehicle. It controls the intake valves and exhaust valves of the engine. The intake valves are what regulates how much fuel can enter the combustion chamber of the engine. The exhaust valves regulate the amount of exhaust fumes which can leave the exhaust system. The camshaft is connected to the crankshaft, thanks to a chain link and timing belt. This whole setup allows the camshaft to function. The camshaft rotates into a certain position to control the intake and exhaust valves. This rotation is monitored by the camshaft position sensor. As the sensor detects the position of the camshaft, it transmits this information to the engine control unit of the vehicle. The engine control unit, of course, is the central computer of most modern vehicles. It communicates with all the sensors and computer systems of a vehicle. Based on the information it receives, it modifies certain functions of the vehicle. In the case of the camshaft position sensor, the engine control unit will make the fuel injectors put a certain amount of fuel into the chamber based on the information it receives about the camshaft’s position. The spark plug’s timing to create an ignition is also detected here too. This process must always run smoothly for the sake of the engine and its performance. As you can see, the camshaft position sensor has a very important job to do in the vehicle. If the sensor were to malfunction in any way, it could spell trouble for the entire functionality of the vehicle. After all, if the engine does not receive the proper amount of fuel in its combustion chamber, there will be an inadequate amount of power generated. Then you won’t be able to drive anywhere because your car will lose acceleration power or possibly stall altogether. If there is a bad camshaft position sensor next to your engine, there are certain symptoms that you can look out for to detect this problem. The sooner you get the sensor replaced, the less chance you have of breaking down on the road. Below are the top 5 symptoms of a camshaft position sensor. 1) Check Engine Light – The first symptom you will probably notice is the “Check Engine” warning light turning on. This will activate whenever there is an abnormality detected in the engine by the engine control unit. There could be a wide range of engine issues that will cause this warning light to illuminate. A faulty camshaft position sensor is one issue since it is responsible for relaying the camshaft position information to the engine control unit. If this information is inaccurate, the computer will make the fuel injectors put the wrong amount of fuel into the combustion chamber. This will result in the computer warning you about this by activating the light on the dashboard. 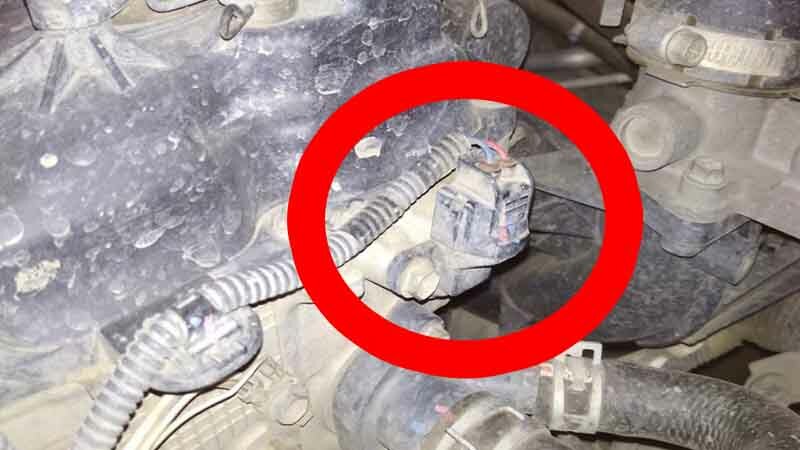 2) Cannot Start Engine – With some cars, a bad camshaft position sensor will prevent its spark plugs from creating a spark which ignites the fuel and air mixture in the chamber. If this happens, you won’t even be able to start your engine after you turn the key in the ignition. 3) Poor Engine Performance – As previously stated, an imbalance of air and fuel in the internal combustion chamber will be reflected in the performance of the engine. As you step on the accelerator, you won’t go as fast as you normally would. If you’re still able to travel at an acceptable speed, then have your vehicle checked immediately. Otherwise, pull over to the side of the road and have it towed to the mechanic. 4) Hard to Shift – Automatic transmission vehicles might have trouble changing gears if they have a bad camshaft position sensor. The gears tend to get locked as the problem gets worse. A locked gear means you won’t be able to shift the gear. If you can, it will take a lot of effort on your behalf. The best thing to do is turn off the engine and turn it back on again after a couple of seconds. Whether this works or not, you should still take your vehicle to the mechanic right away and get this problem looked at. 5) Bad Fuel Economy – Sometimes a bad camshaft position sensor will indirectly result in the fuel injectors putting too much fuel into the combustion chamber. This means you will be consuming more gasoline than normal. The result is more trips to the gas station to fill your fuel tank with gas. There will also be more carbon emissions produced too. As important as the camshaft position sensor is to your vehicle, it does not cost that much to replace it if there is ever a problem. The average replacement cost of a new camshaft position sensor is between $130 and $200. The labor should not take more than one hour, so you will basically be paying the hourly rate of the mechanic. In most cases, their labor for one hour will cost between $70 and $100. The cost of the component itself is anywhere from $60 to $100. The mechanic will likely include fees and taxes on top of these expenses. Therefore, be prepared to have a few hundred bucks on standby to cover this replacement cost. Be sure to shop around for the cheapest mechanic. Find out the cost of their camshaft position sensors too.